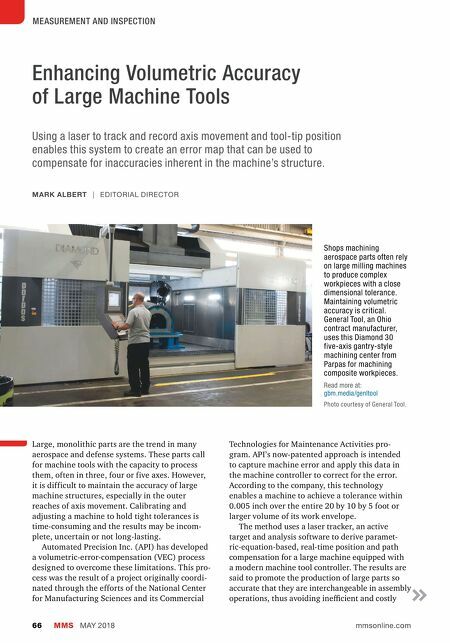 MMS MAY 2018 66 mmsonline.com MEASUREMENT AND INSPECTION Enhancing Volumetric Accuracy of Large Machine Tools Using a laser to track and record axis movement and tool-tip position enables this system to create an error map that can be used to compensate for inaccuracies inherent in the machine's structure. Large, monolithic parts are the trend in many aerospace and defense systems. These parts call for machine tools with the capacity to process them, often in three, four or five axes. However, it is difficult to maintain the accuracy of large machine structures, especially in the outer reaches of axis movement. Calibrating and adjusting a machine to hold tight tolerances is time-consuming and the results may be incom- plete, uncertain or not long-lasting. Automated Precision Inc. (API) has developed a volumetric-error-compensation (VEC) process designed to overcome these limitations. This pro- cess was the result of a project originally coordi- nated through the efforts of the National Center for Manufacturing Sciences and its Commercial Technologies for Maintenance Activities pro- gram. API's now-patented approach is intended to capture machine error and apply this data in the machine controller to correct for the error. According to the company, this technology enables a machine to achieve a tolerance within 0.005 inch over the entire 20 by 10 by 5 foot or larger volume of its work envelope. The method uses a laser tracker, an active target and analysis software to derive paramet- ric-equation-based, real-time position and path compensation for a large machine equipped with a modern machine tool controller. 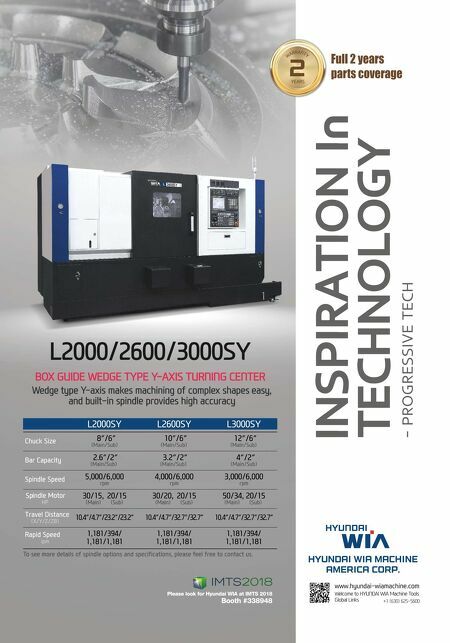 The results are said to promote the production of large parts so accurate that they are interchangeable in assembly operations, thus avoiding inefficient and costly MARK ALBERT | EDITORIAL DIRECTOR Shops machining aerospace parts often rely on large milling machines to produce complex workpieces with a close dimensional tolerance. Maintaining volumetric accuracy is critical. General Tool, an Ohio contract manufacturer, uses this Diamond 30 five-axis gantry-style machining center from Parpas for machining composite workpieces. Read more at: gbm.media/genltool Photo courtesy of General Tool.